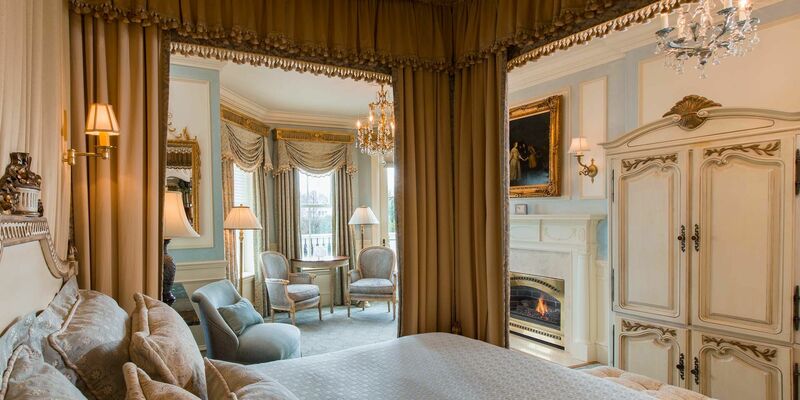 Louis XVI, a signature luxury hotel room in Newport, features neoclassical lines from the French perspective. Immerse yourself in a light-filled room with refined lines and delicate details, characteristic of this intriguing architecture. Go to bed amongst soft palates of blues and creams, hand-painted leaf and ribbon designs and impeccable sparkling crystal chandeliers. 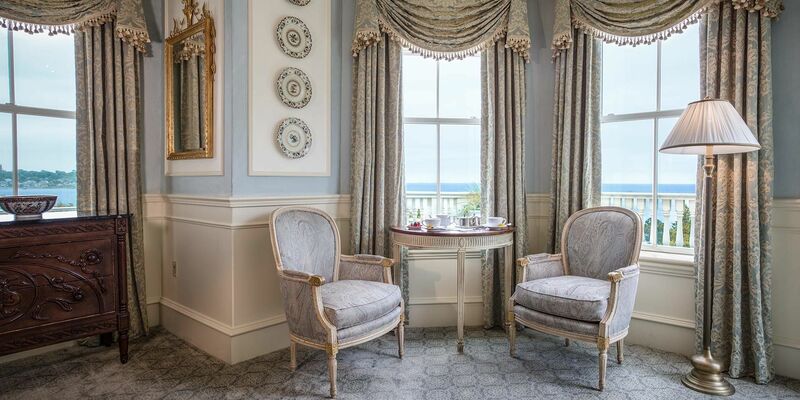 In the morning, enjoy a cup of tea and some macaroons as you look out the window or sit on the deck that offers expansive views of the ocean and mansion’s lawn in these stately accommodations in Newport, Rhode Island. 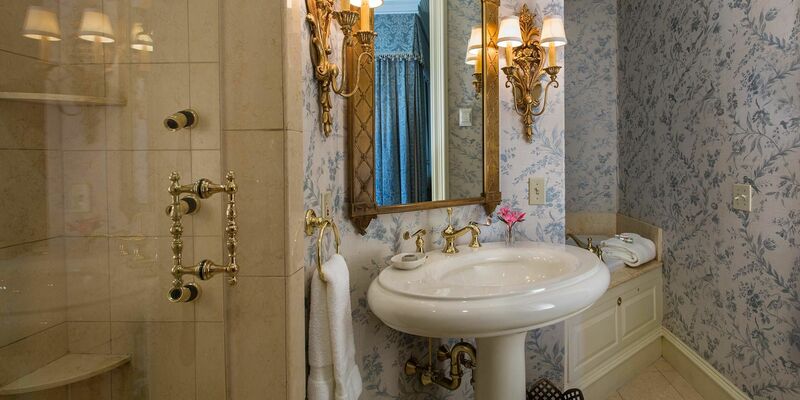 Whether you’re looking for a luxurious experience in the vanilla-colored marble bath that boasts a double Jacuzzi, large shower with body jets, and crystal chandelier, or need to get some work done on the small antique writing desk, the Louis XVI Room is sure to please even Marie Antoinette. 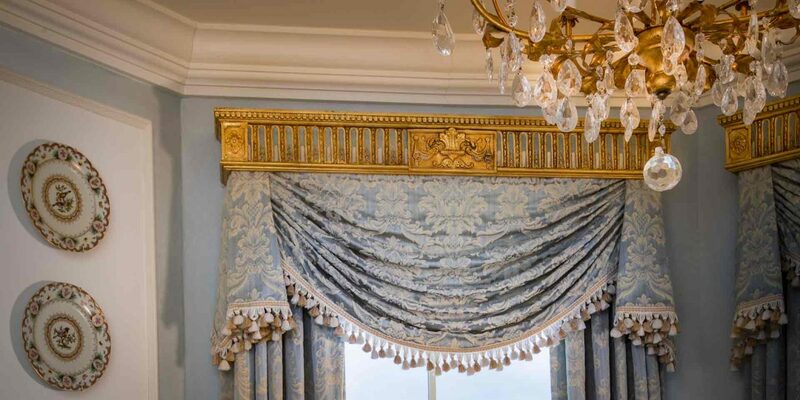 The Louis XVI Room is located on the second floor and requires climbing one flight of stairs. Please note: The Chanler does not have an elevator. There’s never been a better time to return to the 18th Century. Enjoy these features in this stunning room choice.